“TURN: Washington’s Spies” Season 2 first poster. With TURN: Washington’s Spies returning for a two-hour premiere on April 13, 2015, the first poster of the second season has been released. The poster features Ian Kahn as George Washington, Jamie Bell as Abraham Woodhull, Seth Numrich as Benjamin Tallmadge, Daniel Henshall as Caleb Brewster, Heather Lind as Anna Strong, Meegan Warner as Mary Woodhull, Kevin R. McNally as Judge Richard Woodhull, Burn Gorman as Major Richard Hewlett, Angus Macfadyen as Major Robert Rogers, Samuel Roukin as Captain John Graves Simcoe, JJ Feild as Major John André and new cast member Owain Yeoman as Benedict Arnold. Not seen is new cast member Ksenia Solo as Peggy Shippen. The complete first season of TURN: Washington’s Spies will arrive on DVD and Blu-ray on March 17, 2015. 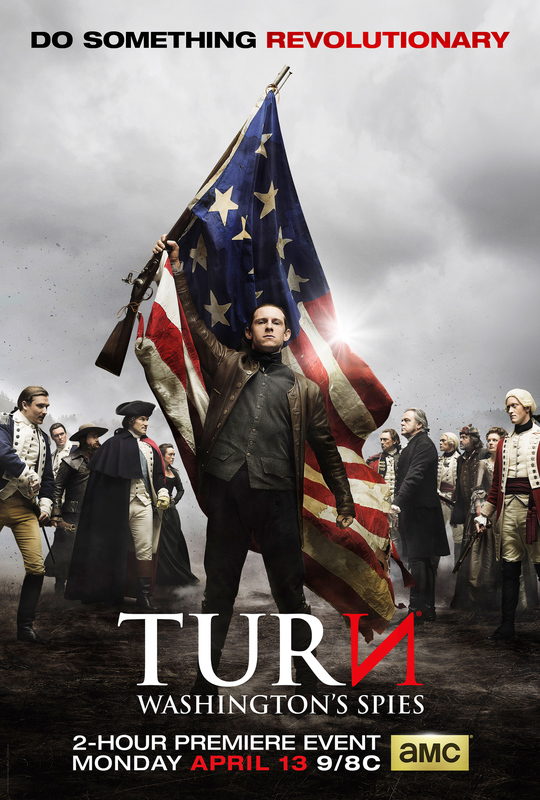 Fans can also watch the first season of TURN: Washington’s Spies on AMC.com until March 24, 2015 and can watch it on Netflix beginning on March 25, 2015. You can learn more about TURN: Washington’s Spies on the official site, Facebook and Twitter. Comments for “TURN: Washington’s Spies” Season 2 First Poster Released are now closed.